It’s finally starting to warm up here in Andover as Spring approaches and this marks our favorite time of year. Spring is such a great time because it’s when lawns can display the first colorful tones and bright hues of the year after undergoing a long cold winter. The beautiful hues of spring flowers not only create an excellent aesthetic, flowers also attract bees for needed pollination during the life cycle of flowers. Additionally, Hunker.com reports that “according to a study completed by Virginia Lohr and Caroline Pearson-Mims at Washington State University, plants such as trees or flowers have a positive impact on people and increase a person’s overall feeling of well being.” There are so many benefits to planting a garden this Spring and we here at T&B Landscaping Company can help you get the ball rolling. T&B Landscaping was formed in 2003 to fill a void we found in providing top quality lawn care at a reasonable price. We service residential and commercial properties in the Merrimack valley area. Our company is fully licensed, insured and a proud member of the Better Business Bureau. We provide free estimates for all your landscaping and irrigation service needs. Our landscaping services can provide you with a Spring lawn to be proud! Here are just a few examples of how Andover’s #1 Landscaping Company can get your lawn ready for this Spring. Spring is a great time to spruce up the yard for the new season. At T&B Landscape and Irrigation, we collect all leaves and miscellaneous debris, and remove them from your property. During the winter months, snow can act like a heavy blanket smothering and killing grass underneath. Therefore, as Spring approaches we will comb through your lawn to remove matted and dead grass which will allow the grass to breathe and promote healthy growth. Additionally, our core aeration service improves rooting and helps to enhance infiltration of rainfall or irrigation on the lawn. T&B offers weekly mowing services! At each lawn-mowing visit, we adjust the mowing height based on turf species and local conditions during the growing season. This helps to ensure a healthy greener looking lawn. All debris are removed from the turf areas prior to mowing and grass clipping are always bagged and removed from property to maintain a neat appearance. We offer weekly, bi-weekly or on call weeding services. T&B has the knowledge to differentiate between weeds and flowers. Our experienced team can turn any weed infested mulch bed into a well-manicured weed free mulch bed. Weed control is done manually by hand or through the use of herbicides, which are not harmful to the plant materials located in the shrub or mulch beds. We offer sod installation/renovation for an instant green healthy lawn. There are many options to choose from when it comes to getting a healthy lawn, but no matter which lawn install/renovation you decide to go with T&B will handle it from start to finish with the same end result, a thick green healthy lawn! T&B offers planting arrangements of annuals or perennials to make your ornamental garden beds stand out with color. In addition to flowers, we can also take care of your shrubs, hedges, and trees. Caring for your hedges and shrubs is a vital part of a healthy landscaping. Trimming and pruning not only adds a cosmetic aspect but it is essential for the overall well-being of your shrubs and hedges. 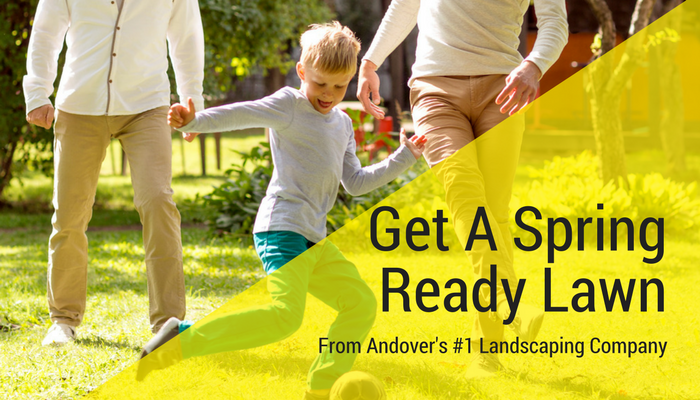 No Replies to "Get A Spring Ready Lawn From Andover's #1 Landscaping Company"